John Tsitouris is about as common as they come. He didn’t have much of a career, though this card represents the peak of his somewhat brief MLB tenure (though he did appear in 11 different seasons). This card’s a pretty solid EX. The trivia question asks who the last A.L. pitcher to win 300 games was. The answer (not rubbed off here) at the time was Early Wynn, who won his 300th and final game on July 13, 1963, as a member of the Indians. He pitched his entire 23-year career in the A.L. As for Tsitouris, he was so forgettable as a player that Topps used the same photo for his card…three years apart. Yes, they reused the photo from his 1963 card for his 1966 card, hoping that nobody would notice. I think I’m the first person. Tsitouris was signed by the Tigers in 1954 and debuted in 1957. After appearing in two games, he was traded to Kansas City in a mind-numbing 13-player deal that included Billy Martin. After three rough years with the A’s, he was traded to Cincinnati for Joe Nuxhall. He didn’t play in the majors at all in 1961, and only got into four games in 1962. But he made the Reds’ rotation in 1963 because he had good numbers in AAA in ’62 and pitched well in his limited action with the big club. 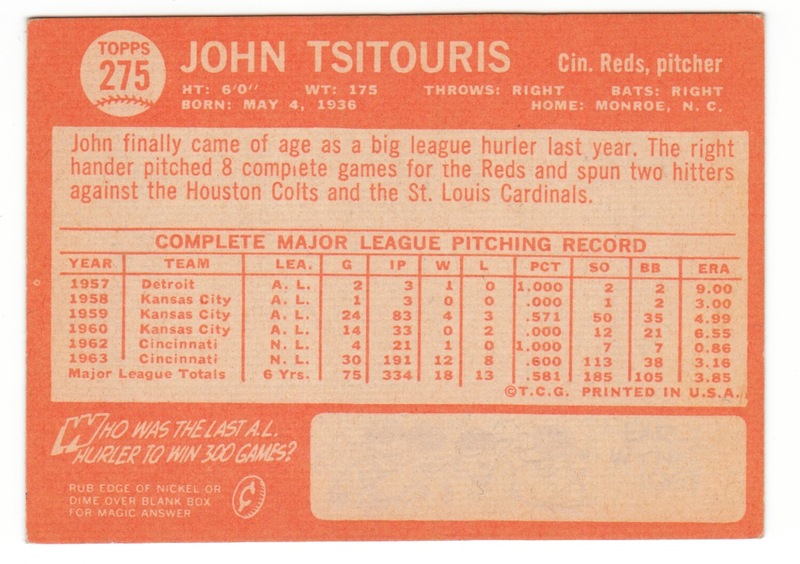 Tsitouris has his best season in ’63, when he went 12-8 with a 3.16 ERA (though that was only a 106 ERA+) and 1.07 WHIP. He finished in the top 10 in the N.L. in K/9, BB/9 and H/9. The next two years, his ERA rose to 3.80 and then 4.95. While his strikeout numbers got better in ’64, he walked twice as many batters as in ’63. 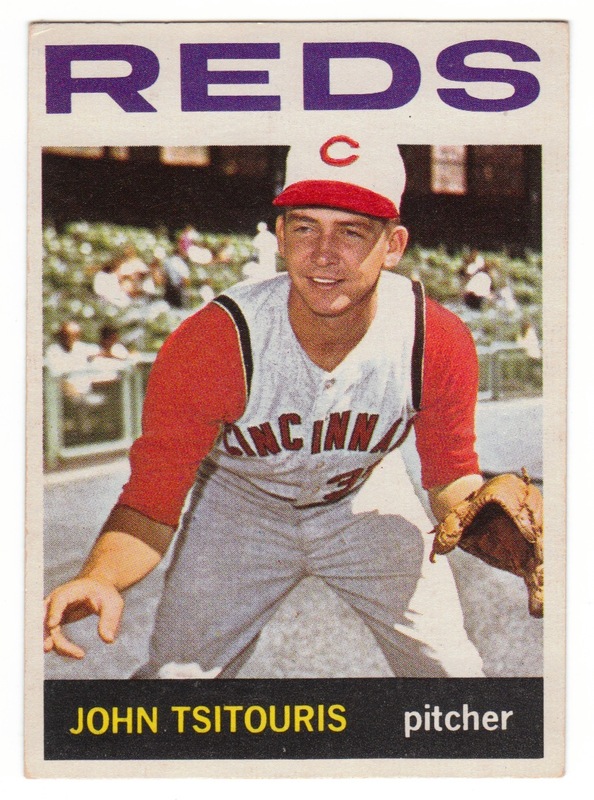 After the rough year in 1965, he spent most of the next three seasons in AAA, throwing a grand total of 21 2/3 innings for the Reds. He was out of baseball by age 32. I haven’t been able to find what Tsitouris has been up to since 1968. He’s currently 73 years old.